Mobile phone has become a core part of our life and instrumental in decreasing our load by storing important data. Now what if all of your data got corrupted or just being deleted because of operation fault, too risky right? That's why backing up your data is one of the safest ways to let the data not get away from you! As Android holds the majority of mobile users so in here I show you the best Android Backup solutions that you can download from Play Store. This app is a simple apk assistant which stores apk files that are not being frequently used and thus free up more storage on the device. Like every other backup app you can also backup SMS, call logs, contacts to internal Storage .It also supports backing up data to Google Drive and allows transferring apk files between Android devices. The disadvantage of this app is that it can backup your apk files only and not your apk data. Also auto-backup is not supported via Cloud Backup. Android Assistant has been one of the best Android backup software till date and what makes it different from other backup apps is that it can backup the device as a whole or only backup the data you care about. The data will be saved to a PC or Mac so the backup file won't eat up the phone storage. Most importantly, rooting is not required by this amazing program. You can check this guide to backup personal data to PC in a few steps. In addition, this program supports recovering lost data from Android phone. It has its own Recycle Bin like the one in Windows and the best part is you can control how much time the bin can retain data before a permanent delete of data. It also provides easy transfer of data like contacts,SMS and other files between computer and Android devices. 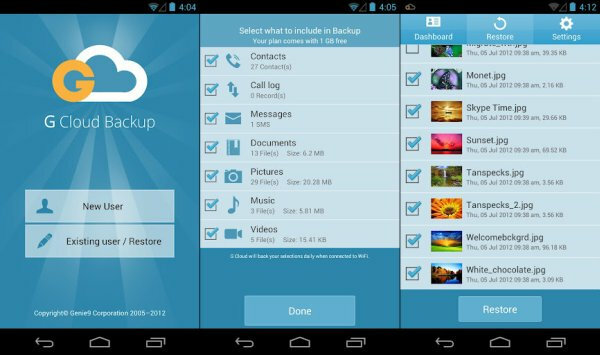 If you have a rooted Android phone then Titanium Backup app is the best choice. It has been rated as the No.1 root app on Twitter. 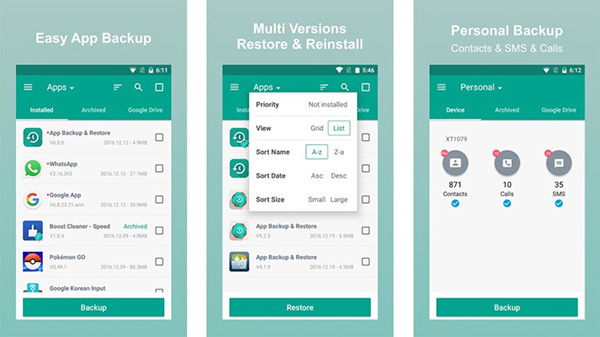 Jaw-dropping features of this app makes its easily to backup and restore data stored on Android. It can also backup apps as well while running them in background. In recent update, Titanium app adds cloud sync with Google Drive and Dropbox .The Pro version of the app includes a lot of useful features and has a reasonable price so it's worth giving a try! Cons of this app are that the user interface looks outdated. And it requires a compulsory rooted Android device. Plus, the best features (most of them) of this app are only availaible in paid version. 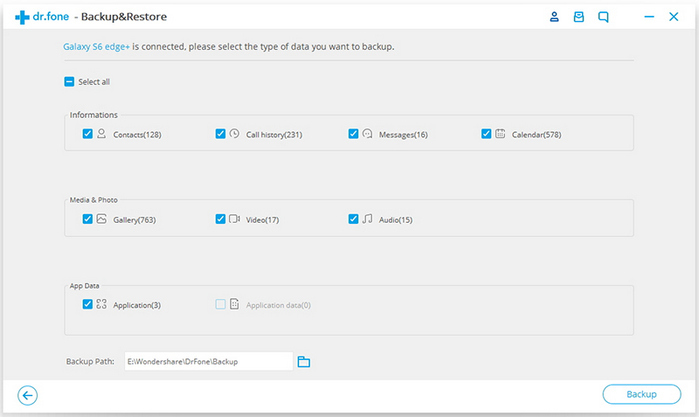 G-Cloud Backup provides a cloud based backup service to Android customers. Actually, it is not the official app made by Google but it works great to backup private data to cloud, like photos, contacts, text messages. However, the free storage is only 1G. You need to pay if free storage is not enough. Backup process will only start when device is connected to a WiFi network. Helium is another backup app that does not require root. 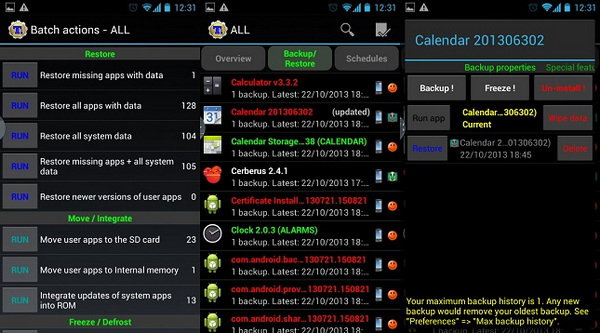 It can not only backup personal content on Android device like the other apps do, it is also able to sync Android device with computer in real time. However, you should install both Helium app on Android and Helium desktop on PC. Free-version allows you to backup and restore from backup. While the paid version has following features: No Ads; Android to Android sync and Cloud backup and restore, which supports Drive,Dropbox and Box. All the above apps are top rated in Google Play Store. Now the question arises which one is the best among all? If the device was rooted then Titanium is the best you've got. For the non-rooted user, Android Assistant is the best choice in my own opinion as it not only suppports Android devices, but also for iOS devices, like iPhone, iPad or iPod. Thus all you need is one app for all different devices.